Features: Heavy duty sectioned cast iron top grates. 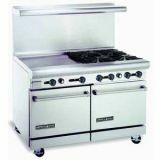 Two piece, lift off top, easy clean burners, Rated at 32,000 BTU/hr. each. One standing pilot for each burner, for instant ignition. Removable full width drip pan. Ovens rated at 35,000 BTU's each. Griddle rated at 40,000 BTU's ( 2 burners @ 20K each). 1 year parts & labor warranty.